Agritourism, economy, and environment were among the reasons Terrell County followed Dougherty County and passed a resolution against the Sabal Trail pipeline. FERC didn’t post the County Chairman’s cover letter, but the County Clerk sent it to me. What else has FERC neglected to post? 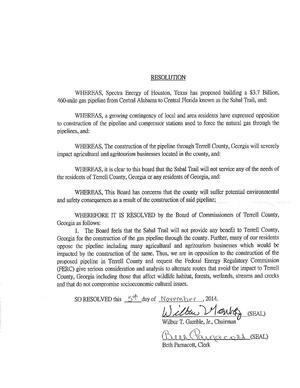 Filed with FERC 13 November 2014, Protest of Terrell County Board of Commissioners (Georgia) under PF14-1.